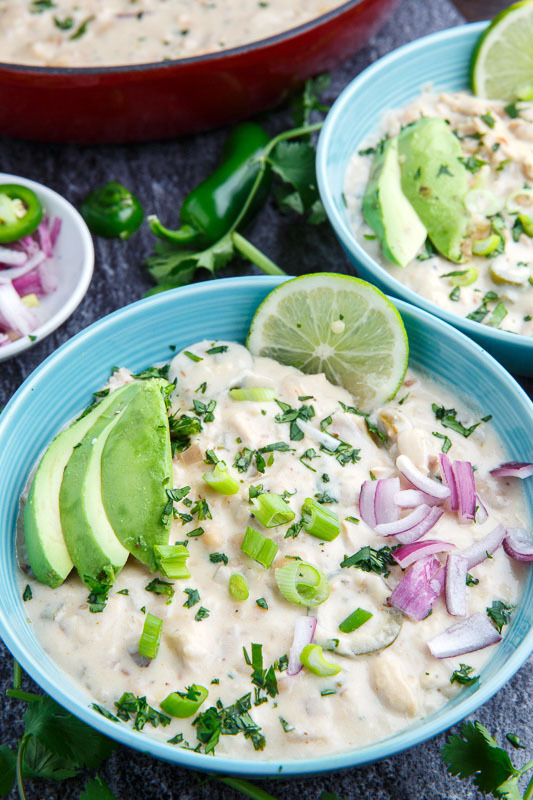 A smooth and creamy white chicken chili with cream cheese! 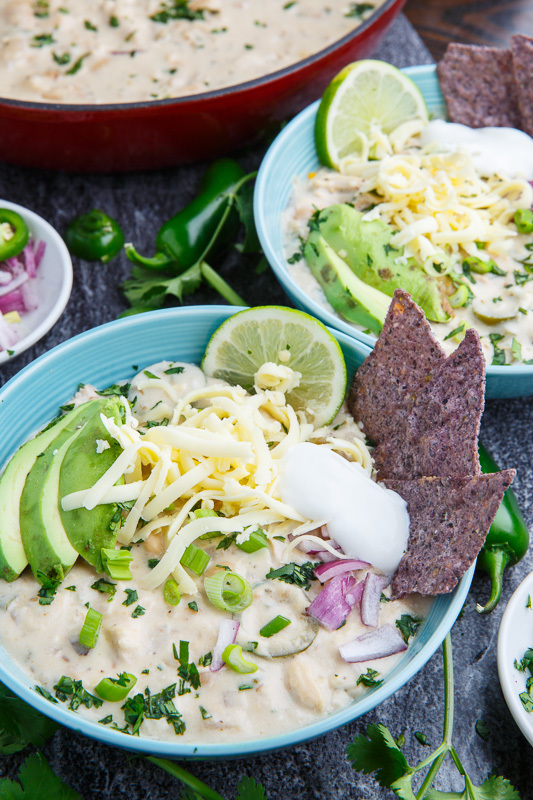 It’s time for another recipe to enjoy while watching the Big Game, one that is perfect for these chilly days, a creamy white chicken chili. 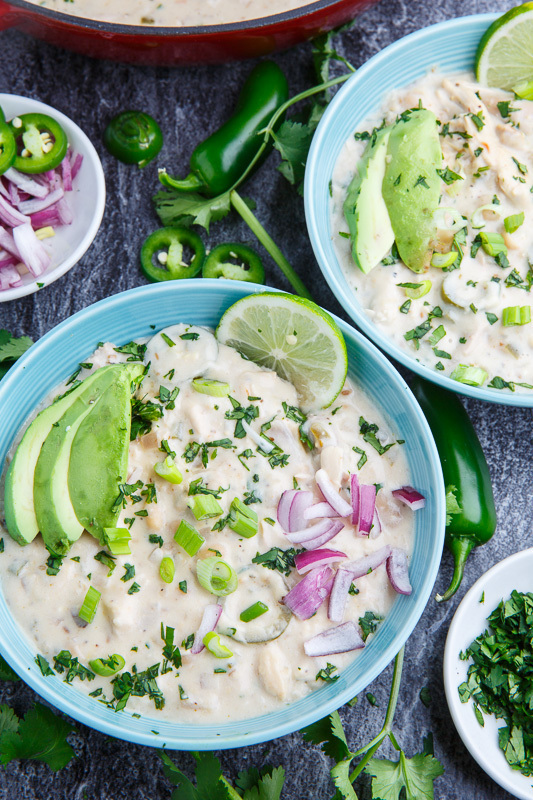 This is basically a chili recipe where instead of having a red chili and tomato base or a green chili and tomatillo base it has a white cream and chili base. 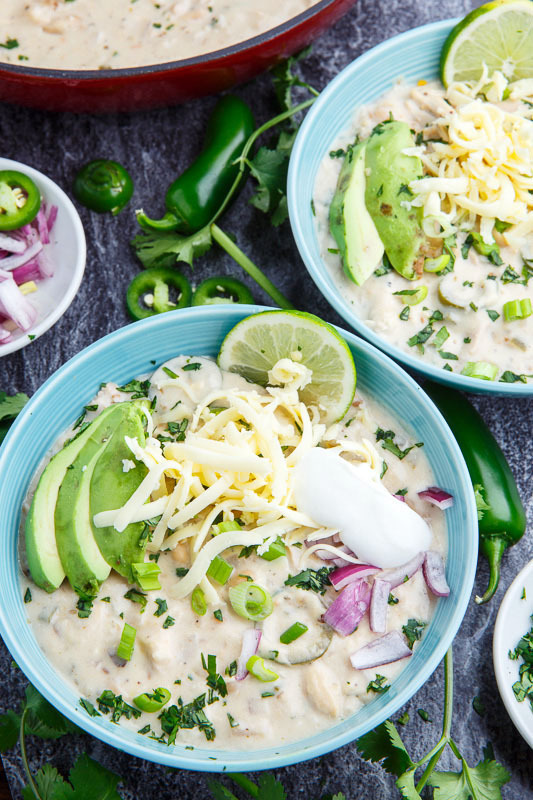 This chili starts out with onions, garlic and the chilies, jalapeno chilies, followed by chicken broth, chicken and white beans before adding cream cheese and sour cream to give the soup the white colour and oh so smooth and creamy texture! I don’t use cream cheese nearly often enough in soups and making this soup recently reminded me that I need to do it more as it’s so amazingly good! The broth ends up nice and thick and tangy from cream cheese and sour cream. 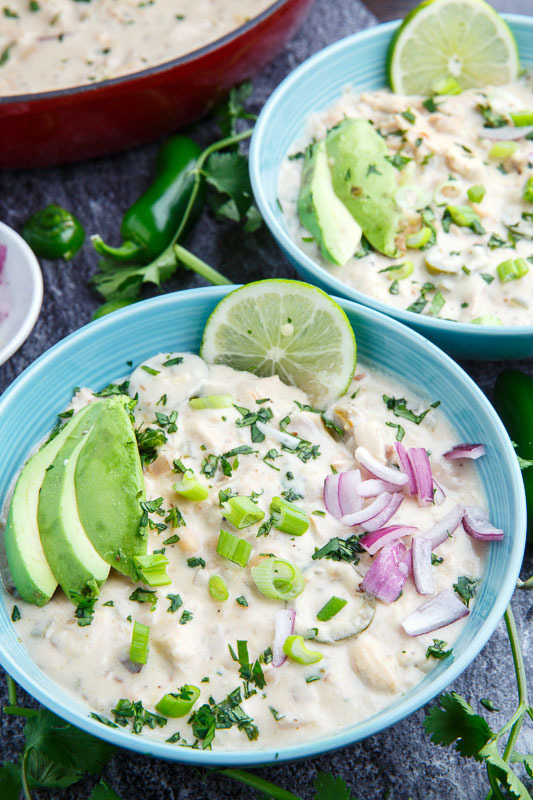 This creamy white chicken chili comes together in no time and it’s perfect for enjoying while watching the football game or any other time! Garnish with your favourite ingredients! Heat the oil in the pan over medium heat, add onion and jalapeno peppers and cook until tender, about 5-7 minutes. Add the garlic and cumin and cook until fragrant, about a minute. Add the broth and deglaze the pan by scraping any brown bits up off the bottom of the pan with a wooden spoon as the broth simmers. Add the chicken, beans and oregano, bring to a boil, reduce the heat and simmer for 10 minutes. Ad the cream cheese and cook until melted before removing from the heat, mixing in the sour cream and seasoning with salt and pepper to taste. Note: Low fat cream cheese works! Option: Add veggies like carrots and/or celery along with the onions. Option: Add corn just before removing from heat. Option: Add a tablespoon lime juice just before removing from heat. Option: Garnish with your favourite taco style toppings such as cheese, cilantro, jalapenos, onions, tortilla chips, avocado, limes, sour cream, etc. Option: Replace the cream cheese and sour cream with a second cup of white beans that are pureed in some of the broth until smooth. 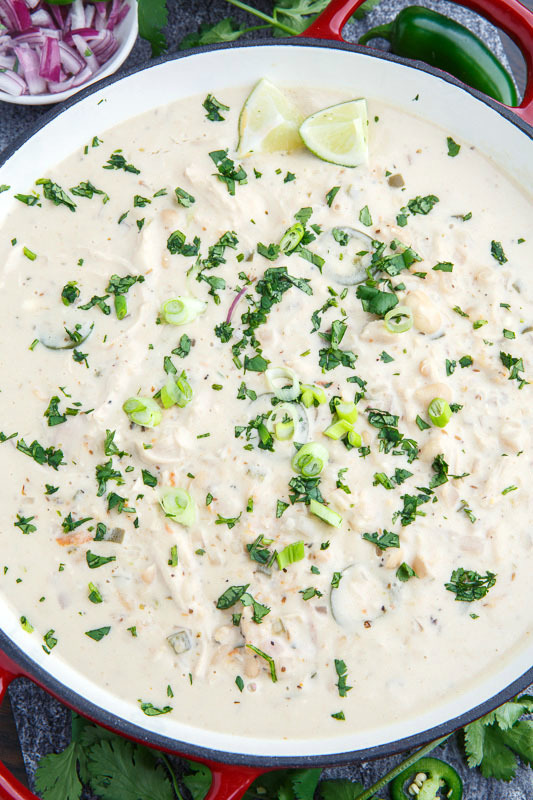 This gives you the smooth and creamy soup without the guilt of the cream cheese and sour cream! Super tasty and easy to make! Can recommend the white beans+lime options. Stuff like green peas and yellow pepper are also good to add just before you remove pan from heat.